What’s on your wish list for a kitchen? For AMEK’s co-owner Matt Schmidt, the kitchen is a prime space to make clients happy. We ask a lot of questions about how you use your current space – what works and what is a frustration. 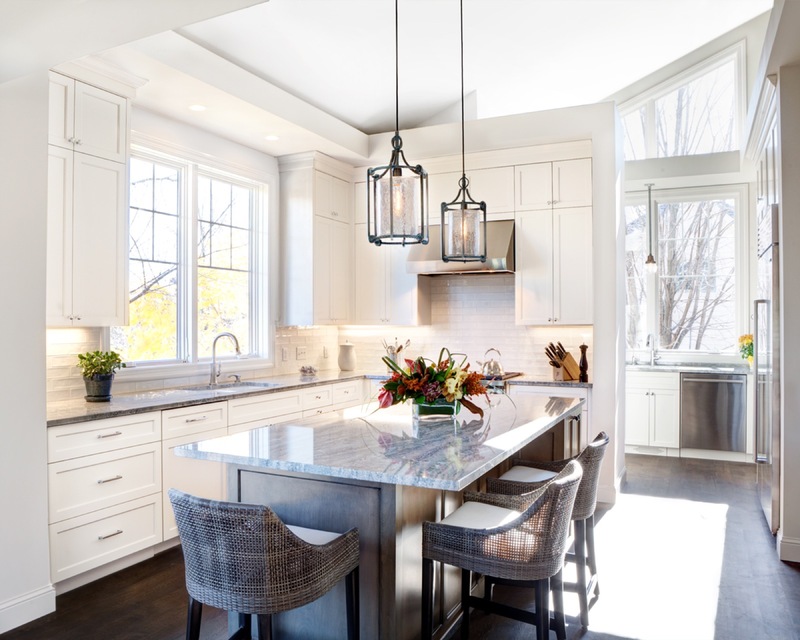 The island in this Edina kitchen is the homeowners’ favorite spot to enjoy their morning coffee and to read the news. Sometimes, the wish list is very specific. For instance, we’ve had clients who use a lot of spices when they cook, so we incorporated several narrow pull-out drawers next to the prep area so it’s easier to find needed spices. For another family who invites large groups to their home for meals, they wanted additional areas to do prep work since they encourage guests to cook with them. Another example is making sure we built in lit display cabinets for the clients’ favorite china pieces. 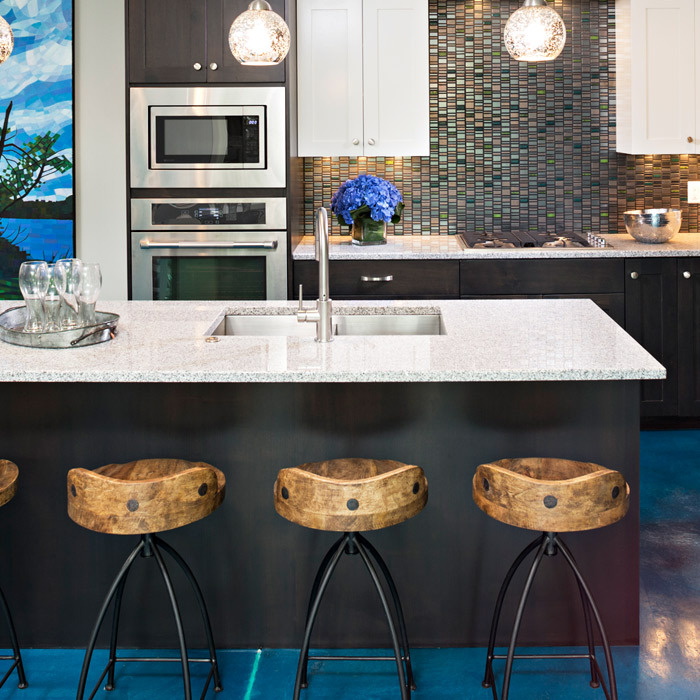 Often it’s a matter of improving traffic flow, adding countertop space, and updating the overall look. For some clients, shifting or removing walls helps accomplish a more open concept to connect with the living and dining rooms. To make it more cohesive, the flooring is changed so it’s the same throughout the main level rather than the kitchen having a different material like tile. 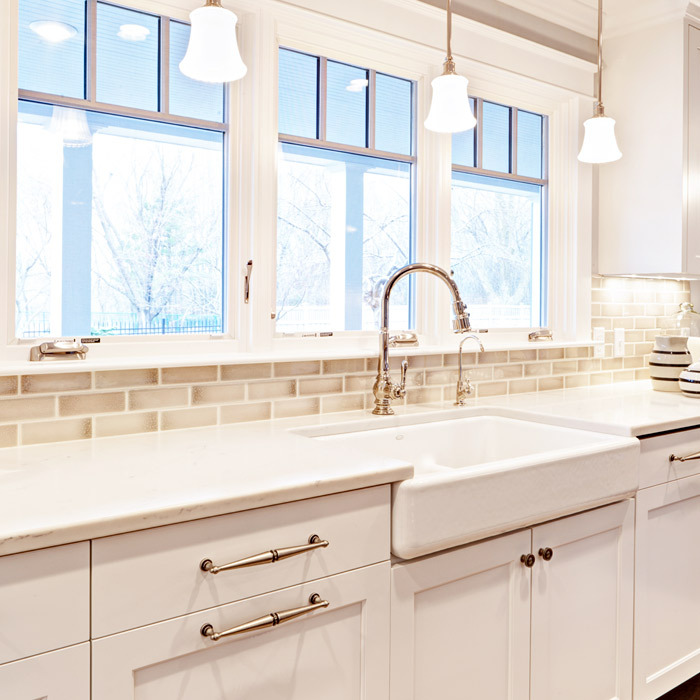 Apron sinks, also known as farmhouse style sink, are nostalgic and practical. Apron sinks also called a farmhouse style have been requested by clients. The overhanging edge of the apron sink eliminates the need for the normal strip of countertop which means it’s a little easier to use without leaning over so far. Some people like them for their nostalgic look while others like the range of sizes and materials it can be made out of. Islands continue to be one of the most common wishes by our customers. Clients want them to be larger allowing for a prep area or seating for a couple of people. “Islands are multi-purpose – they work for prepping meals, a serving area, unpacking groceries, and doing homework,” Matt notes. Many of our clients like multiple cabinet finishes which adds a visual interest and a nice touch. Quite often, AMEK installs frameless cabinets which cleans up the lines of the kitchen. Other options clients like are cabinets with glass doors and lights, lift up doors that are like garage doors opening upward, and customized drawers and shelving. Appliances are more likely to be “hidden” by being covered by a matching cabinet door so they blend in or by appliance “garages” that have a door that can be left open for easy everyday accessibility or closed when guests are coming. Are you ready to share your wish list to see what our AMEK design team can do to improve your kitchen’s functionality and appearance? If so, give us a call and let’s start the discussion!